A new nightclub called Ghost Notes is set to open next month in South London. The club's owners, who also run local pubs The Montpelier and White Horse, are promising to champion South London's "thriving music community". The new venue is located in the same multi-storey car park as Frank's Bar and Bold Tendencies and will feature a world-class sound system and service orientated bar. For the opening night on December 13th, Ghost Notes will welcome a genuine South London legend in the form of Kwake Bass who'll be celebrating the launch of his new label DEM1NS with a special show. 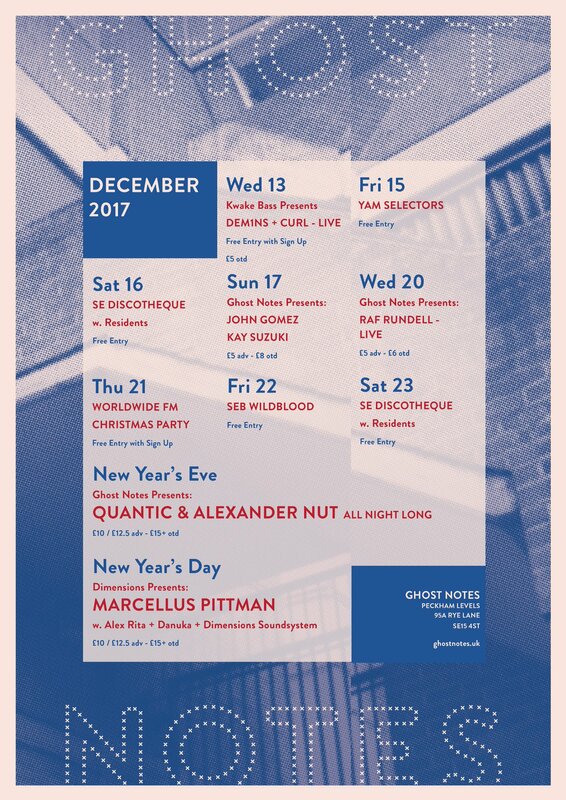 For New Year's Eve, the venue has booked Quantic and Alexander Nut to play, whilst Marcellus Pittman is lined up for New Year’s Day. The club is also planning on hosting a program of live music during the week and DJs on the weekend. The venue's organisers have announced that Saturdays will feature in-house residents SE Discotheque, comprising of Will Lister, Jess Farley and more. Sunday afternoons are said to feature “well-respected selectors and guests from around the world,” with the first party hosted by Rush Hour regular John Gomez. For tickets and more information, head here.